Catholic News World : Novena to Our Lady Undoer of Knots - Favorite of Pope Francis - Miracle Prayer - Share! 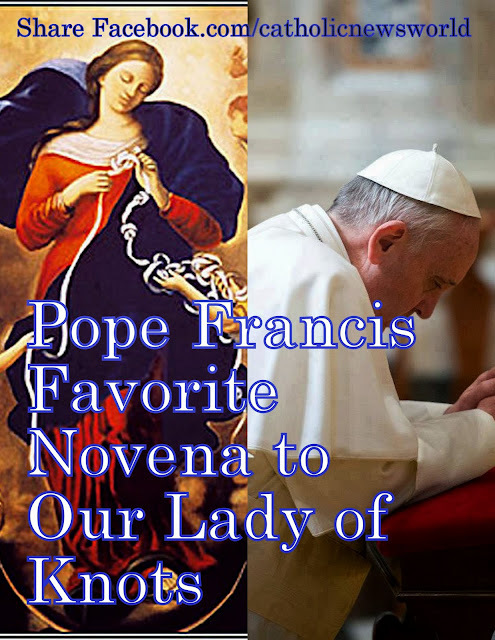 Novena to Our Lady Undoer of Knots - Favorite of Pope Francis - Miracle Prayer - Share! While studying in Germany in the 1980s, Pope Francis discovered this devotion at the Church of St. Peter in Augsburg. This devotion had a great influence on the devotional life of Pope Francis. As archbishop of Buenos Aires, he introduced and encouraged the devotion to Our Lady, Undoer of Knots. An artist named Johann Melchior Georg Schmittdner painted Mary Undoer of Knots. Since 1700, his painting has been in the Church of St. Peter in Perlack, Augsburg, Germany. It was originally inspired by a meditation of Saint Irenaeus (Bishop of Lyon and martyred in 202) based on the comparison between Eve and Mary, who said:“Eve, by her disobedience, tied the knot of disgrace for the human race; whereas Mary, by her obedience, undid it”. Dearest Holy Mother, Most Holy Mary, you undo the knots that suffocate your children, extend your merciful hands to me. I entrust to You today this knot....and all the negative consequences that it provokes in my life. I give you this knot that torments me and makes me unhappy and so impedes me from uniting myself to You and Your Son Jesus, my Savior. I run to You, Mary, Undoer of Knots because I trust you and I know that you never despise a sinning child who comes to ask you for help. I believe that you can undo this knot because Jesus grants you everything. I believe that you want to undo this knot because you are my Mother. I believe that You will do this because you love me with eternal love. The one who seeks grace, finds it in Mary's hands. Powerful Mother, by your grace and intercessory power with Your Son and My Liberator, Jesus, take into your hands today this knot...I beg you to undo it for the glory of God, once for all, You are my hope. Mary, Beloved Mother, channel of all grace, I return to You today my heart, recognizing that I am a sinner in need of your help. Many times I lose the graces you grant me because of my sins of egoism, pride, rancor and my lack of generosity and humility. I turn to You today, Mary, Undoer of knots, for You to ask your Son Jesus to grant me a pure, divested, humble and trusting heart. I will live today practicing these virtues and offering you this as a sign of my love for You. I entrust into Your hands this knot (...describe) which keeps me from reflecting the glory of God. Meditation for Day 3Meditating Mother, Queen of heaven, in whose hands the treasures of the King are found, turn your merciful eyes upon me today. I entrust into your holy hands this knot in my life...and allthe rancor and resentment it has caused in me. I ask Your forgiveness, God the Father, for my sin. Help me now to forgive all the persons who consciously or unconsciously provoked this knot. Give me, also, the grace to forgive me for having provoked this knot. Only in this way can You undo it. Before You, dearest Mother, and in the name of Your Son Jesus, my Savior, who has suffered so many offenses, having been granted forgiveness, I now forgive these persons...and myself, forever. Thank you, Mary, Undoer of Knots for undoing the knot of rancor in my heart and the knot which I now present to you. Amen. Turn to Mary, you who desire grace. Undo this knot in my love...., O mother, and ask Jesus to heal my paralytic faith which gets down hearted with the stones on the road. Along with you, dearest Mother, may I see these stones as friends. Not murmuring against them anymore but giving endless thanks for them, may I smile trustingly in your power. Mother, Undoer of Knots, generous and compassionate, I come to You today to once again entrust this knot...in my life to you and to ask the divine wisdom to undo, under the light of the Holy Spirit, this snarl of problems. No one ever saw you angry; to the contrary, your words were so charged with sweetness that the Holy Spirit was manifested on your lips. Take away from me the bitterness, anger and hatred which this knot has caused me. Give me, o dearest Mother, some of the sweetness and wisdom that is all silently reflected in your heart. And just as you were present at Pentecost, ask Jesus to send me a new presence of the Holy Spirit at this moment in my life. Holy Spirit, come upon me! Queen of Mercy, I entrust to you this knot in my life...and I ask you to give me a heart that is patient until you undo it. Teach me to persevere in the living word of Jesus, in the Eucharist, the Sacrament of Confession; stay with me and perpare my heart to celebrate with the angels the grace that will be granted to me. Amen! Alleluia! Mother Most Pure, I come to You today to beg you to undo this knot in my life...and free me from the snares of Evil. God has granted you great power over all the demons. I renounce all of them today, every connection I have had with them and I proclaim Jesus as my one and only Lord and Savior. Mary, Undoer of Knots, crush the evil one's head and destroy the traps he has set for me by this knot. Thank you, dearest Mother. Most Precious Blood of Jesus, free me! Meditation for Day 8Virgin Mother of God, overflowing with mercy, have mercy on your child and undo this knot...in my life. I need your visit to my life, like you visited Elizabeth. Bring me Jesus, bring me the Holy Spirit. Teach me to practice the virtues of courage, joyfulness, humility and faith, and, like Elizabeth, to be filled with the Holy Spirit. Make me joyfully rest on your bosom, Mary. I consecrate you as my mother, Queen and friend. I give you my heart and everything I have (my home and family, my material and spiritual goods.) I am yours forever. Put your heart in me so that I can do everything Jesus tells me. Most Holy Mary, our Advocate, Undoer of Knots, I come today to thank you for undoing this knot in my life...You know very well the suffering it has caused me. Thank you for coming, Mother, with your long fingers of mercy to dry the tears in my eyes; you receive me in your arms and make it possible for me to receive once again the divine grace.